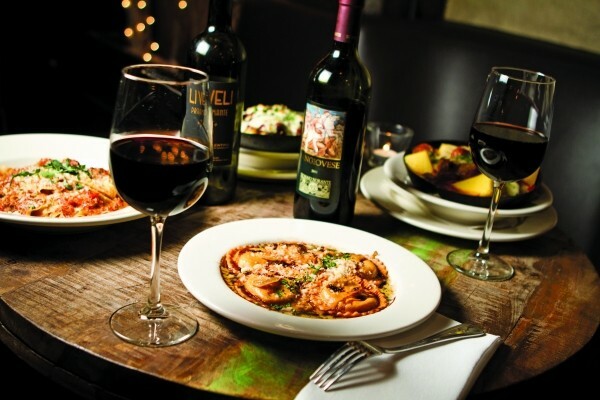 Italian fare from Caffe Molise paired with wines from BTG wine bar. Even as we waltz into 2014, ringing in the new year, I’m inclined to take a look at the not-so-new. It’s hard for me to believe, but I first wrote about Caffé Molise back in 1994, when Shelly DeProto owned and ran the then-tiny restaurant. Salt-n-Pepa’s “Whatta Man” and Beck’s “Loser” were on the radio. In those days, the tables and chairs were plastic patio furniture. And, if memory serves, there couldn’t have been more than 10 tables in the place. The menu was minimal. There wasn’t much in the way of authentic Italian cuisine in downtown Salt Lake City in 1994—Olive Garden doesn’t count—and I remember being introduced at Caffé Molise to what is now one of my very favorite go-to dishes: aio e oio, garlic and oil. It’s a simple, yet sensational, dish of nothing more than al dente spaghetti with garlic, olive oil and red chili flakes. Aio e oio is long gone from the Caffé Molise menu, but I’m sort of hoping that as the restaurant celebrates 20-plus years in business (it opened in late 1993), they’ll bring it back, for old time’s sake. Current owner Fred Moesinger has worked at Caffé Molise off and on pretty much from the beginning, including having a hand in its construction. He officially took the reins of the restaurant in 2003, and both the menu and the restaurant itself have grown substantially since. First, there was the addition of a patio in the pocket park adjacent to the Caffé Molise. Most recently, the eatery merged into the former retail shop next door, creating a third dining room at the restaurant. The menu, too, has expanded, Sunday brunch was added, and the wine list has become formidable. And, speaking of wine, Moesinger doesn’t sit on his hands for long. In addition to growing Caffé Molise, this fall, he opened BTG next door. BTG (By the Glass) is downtown SLC’s first wine bar, and features wine flights and more than 50 premium wines by the glass, as well as cocktails, beer and food from Caffé Molise. There is little I enjoy more than a relaxing lunch at Molise, especially sipping wine in the courtyard in warm weather. A recent indoor lunch with the missus and a friend was a reminder of how solid the cooking is at Caffé Molise. The appetizers are whoppers—big enough for a quartet to share. We started off with what I consider the best bruschetta around: toasted, garlic-rubbed baguette slices drizzled with olive oil and topped with a scrumptious herb-infused bean puree, marinated Roma tomatoes and flash-sauteed spinach ($8.95). An equally awesome appetizer is the homemade polenta ($9.95). This is what, to my mind, Molise does best: straightforward, no-nonsense dishes without smoke and mirrors. The large polenta cakes are roasted and then served with a fresh, simple tomato-basil sauce that tastes like it came straight from the garden. Just as simple and rewarding is aglio e pomodori ($6.95), which is nothing more than roasted garlic drizzled with olive oil and served with fresh herbs and sun-dried tomatoes. Killer cooking doesn’t have to be complicated. With wineries like Soter, Bucklin, Latour, Rosenblum, Caymus, Judd’s Hill, Altamura, Orin Swift, Atrea and others represented at Caffé Molise—not to mention a smart selection of beers, dessert wines, liqueurs, spirits and digestifs—there is plenty to sip alongside a Molise meal. I suggest di Majo Norante Sangiovese ($6/glass) from the Molise region of Italy, or maybe La Valentina Montepulciano d’Abruzzo ($7/glass) to pair with pappardelle al sugo ($15.95). This is a hearty, heavenly dish that begins with perfect pappardelle, made in-house. The pasta is tossed with a rich, deep-flavored sauce of slow-cooked beef, pork and tomatoes, then topped with grated Asiago. It’s one of my top 10 favorite Utah restaurant dishes. I must say, though, the gnocchi di patate ($15.95) is damned hard to top. Fresh, plump potato & semolina gnocchi (small dumpling-like pasta) are bathed in a light tomato-cream sauce and garnished with fresh basil and pine nuts. A plate of ravioli con zucca ($12.95) that I shared with my lovely wife was incredibly decadent: Homemade butternut squash ravioli is served with tongue-tingling garlic brown butter, balsamic reduction and Asiago cheese. It’s that wonderful contrast of sweet and salty that Reese’s Peanut Butter Cup addicts like myself love so much. Back in the day, Caffé Molise featured lasagna that came from then-owner DeProto’s grandmother’s recipe. It’s still on the menu: a traditional, hearty, meat lasagna made with a blend of seasoned beef, Italian sausage, ricotta, Asiago and marinara sauce ($15.95). Another terrific choice is involtini di pollo ($19.95)—thin slices of boneless chicken breast rolled and stuffed with sun-dried tomatoes, prosciutto, herbs and Asiago, served with a silky white wine and butter sauce. It’s not easy to make chicken involtini that doesn’t dry out from cooking, but Caffé Molise’s was tender and moist. And the kitchen was quite accommodating when my friend asked if they could make this dinnertime menu item during lunch. They did, and it was delicious. I’m not a vegetarian, and I’m also not crazy about eggplant. However, in the service of restaurant criticism I thought I should try the polpette di melanzane ($15.95). Well, it turns out I loved the vegetarian eggplant “meatballs,” served in a shallot and tomato-cream sauce with grilled asparagus and polenta wedges. Caffé Molise isn’t the newest kid on the block—BTG is—but this little jewel of an Italian restaurant is aging like fine Barolo.